Home › Christianity › 1 Corinthians 9: Apostle Paul’s Missionary Deception (Taqiyya)! 1 Corinthians 9: Apostle Paul’s Missionary Deception (Taqiyya)! Paul is confesses here that he acted as a Jew in order to convert them to his faith. He even acted as a pagan so that he can lure them to his religion. The above verse shows that Paul would go in great lengths to spread his religion by deception. Let’s see now what the experts have to say on the above passage. “How even Apostles thought that a lie was often useful and the truth injurious. “Instructed by which examples, the blessed James also, and all the chief princess of the primitive Church urged the Apostle Paul in consequence of the weakness of feeble persons to condescend to a fictitious arrangement and insisted on his purifying himself according to the requirements of the law, and shaving his head and paying his vows, as they THOUGHT THAT THE PRESENT HARM WHICH WOULD COME FROM THIS HYPOCRISY WAS OF NO ACCOUNT, but had regard rather to the gain which would result from his still continued preaching. For the gain to the Apostle Paul from his strictness would not have counterbalanced the loss to all nations from his speedy death. AND THIS WOULD CERTAINLY HAVE BEEN THEN INCURRED BY THE WHOLE CHURCH UNLESS THIS GOOD AND SALUTARY HYPOCRISY HAD PRESERVED HIM FOR THE PREACHING OF THE GOSPEL. FOR THEN WE MAY RIGHTLY AND PARDONABLY ACQUIESCE IN THE WRONG OF A LIE, WHEN, AS WE SAID, A GREATER HARM DEPENDS ON TELLING THE TRUTH, AND WHEN THE GOOD WHICH RESULTS TO US FROM SPEAKING THE TRUTH CANNOT COUNTERBALANCE THE HARM WHICH WILL BE CAUSED BY IT. When one reads the above verse, it becomes more evident that Paul used deception in many instances. Of-course Christian apologists in a desperate attempt to save Paul’s neck, they will say: “these words are not Paul’s but the words of the Corinthians who are accusing Paul of this”. Whatever way apologists want to put it, the verse is very clear that Paul confesses to using deception or the Christian Corinthians say that of Paul. If apologists don’t agree, saying it was the Corinthians accusing Paul of this, charging him with deception, either way Paul is a deceiver. Earliest Christians themselves didn’t find Paul to be truthful, so how can Christians of today try defend him, when the Corinthians charged Paul with deception? The academic evidences presented shows that Paul indeed sanctioned lying. 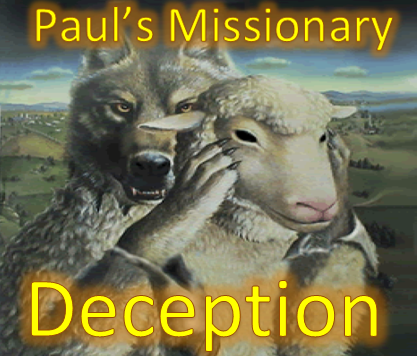 Paul not only deceived people, but also demonstrated to his Paulinism followers how to deceive humans. This kind of deception is very widespread. One only needs to look at third world countries and see for themselves, how missionaries deceive, con people out of their lives. « Now we know why the Gospels are “according to so-and-so”! May God bless for your noble efforts! This is really a useful combat kit against the deceptive missionaries! Paul was a Jew by heridity and faith who was under the law till he was set free from the law by faith in Christ. So Paul was not being deceptive one bit. Sorry but this new doctrine will not fly. Keep drinking that kool aid. Mind you, Paul despised women, and disliked Christ. His letters are the main chapters in the Bible. Matthew, Mark, Luke and John are the most reliable. The Gospel according to Dan ??? Christ came to set you “free” from the Law??? Where does Jesus say this???? Salam alaikum, Kaleef. Paul becoming as the people whom he was preaching the Gospel to wasn’t deceptive, but rather a genuine understanding of their beliefs and culture and how it relates to the Gospel he was teaching. It wasn’t a deceptive use of Paul’s unrighteous cunning that he brought into his evangelism, but through God’s Correction that he heeded after initially causing offense, destroying people’s livelihoods and being put in jail for it. There is nothing deceptive about loving, understanding, having compassion and respect for the people he taught the Gospel to. If you want to correct people whom actually do evangelize deceptively it would be more effective to teach them the real way Paul used to bring genuine love and understanding when bringing the Gospel to a people. I understand you mean well, but it is actually counterproductive to vindicate actual deception by perpetuating the idea in their heads that Paul used the same deceptive methods for spreading the Gospel. Paul did not “pretend” to be as the people he was bringing the Gospel to as you are claiming in your article, but genuinely “became” as the people in order to reach them with the Gospel just as he stated in his letters referenced. That may be true but your church fathers (who were closer to the time of the message) understood it precisely as deception. Muslims are always guilt tripped into adopting the opinions of their so called “early church fathers” (dating 200 years after the Quran) so this page is simply reversing the tactic. But then how are we to understand Paul’s confession of deceit at 2 Corinthians 12:16? Now granted, I have not burdened you; yet sly as I am, I took you in by deceit! Paul is totally known and acknowledged to be irascible, cantankerous, abusive, bullying, dogmatic, rigid, unpleasant, misanthropic, and intolerant. Instead of reinventing history, try to stick to what is actually known. Just added another commentary on this passage by John Cassian an early church father, that Paul indeed used deception in 1 Corinthians 9. I think Paul was talkiing about intercultural awareness and using intercultural communication skills. In our world today, we are often reminded about being respectful and undersranding of other people’s cultures and lifestyles when we communicate. Thank you for your efforts to clear up misconceptions that many Christians, Jews &/or Westerners have about Islam. I very much appreciate this. Most of the pages you provide are quite good. It has helped me in trying to explain to other Christians (of which I am one) where they are misinterpreting the Quran or understanding of Islam. I have worked in many Muslim nations and have many Muslim friends. So it concerns me terribly when Christian friends or family read or hear some of these folks who share bad or incorrect information about Islam. I try to answer it whenever I can. It has led me to a lot of study, not merely reading the Quran itself (though not in Arabic, only the English translation), but beyond that. It would be a pity if it became a hindrance to your mission. Hence, I wish to address the verses where you assert that Paul lies. In reading it trying to out myself in your place, I completely understand why you think that. However, if you were to understand the context, Paul’s personal history & his literary style, I think you might come up with a different conclusion. Paul was a unique individual in that he was born a Jew with Roman citizenship. Given the family’s citizenship status, it is thought that perhaps the Roman conqueror of Tarsus, a general called L. Aemilius Paulus, saw something of merit in Paul’s father or grandfather and granted them citizenship. Perhaps Paul’s name reflects that. As for career and economics, Paul’s family had a leather factory or weaving mill, where they manufactured the famous “cilicium” textiles. So, Paul grew up in a wealthy home where he received the best education and opportunities. Church fathers referred to Paul as a tanner or tent maker and, certainly, Paul records tent making enterprises during his journeys as a means of funding. As for culture, Tarsus was home to a renowned Greek university that Strabo, the famous Greek geographer, considered better than Athens and Alexandria. Shortly before Paul’s time, the Stoic philosopher Athenodorus was a noted resident. Paul would have grown up with Stoic culture and ideology all around him & this really comes out in his writing as well as his personal self-denial & willingness to suffer for what he considered to be a greater cause. Hence, Paul came from a vast background where he spoke Aramaic & Greek fluently, had a keen understanding of cultural, ethnic & religious diversity, and was well versed in ancient and current history. He was also trained and adept in the different literary styles that were pertinent to the time period. It was not uncommon for writers and orators in the first century to use different types of presentations, comparative speech (which is what this passage is) and styles of argument when trying to convey a message. He wasn’t above learning something new if it meant he could communicate better. As an adult, Paul experienced both wealth and bankruptcy, renowned position and persecution/prison. He’d lived and worked from Jerusalem to Damascus to Ephesus and beyond. He’d held a variety of jobs and was hosted by a variety of people from the rich to those of modest means. Because of this, he could draw from different portions of his life & experience to relate to a wide group of people and speak to individuals at their level and in their own language. This is not lying nor is it deceptive. Imagine an engineer who regularly gives lectures to other engineers. To do this, he/she would speak in the highest technical terms since other engineers understand that technical language. He/she would speak in incredibly sophisticated terms because other engineers would have the knowledge base and skill set to comprehend at that level. They would refer to well known theories and arguments without explanation as their peer group already understands. To give explanations, definitions or simplified examples would insult the intelligence of competent engineers. When he speaks to his peers, he/she “becomes an engineer” in the fullest sense of the word. Now imagine that same engineer also volunteers with high school students interested in engineering. The way he speaks to these kids is very different from the way he addresses professional engineers. He tries to find ways to teach them foundational concepts. He uses examples that they, as kids, would grasp and he uses simpler terms so they understand what he is saying. He has to define theories and make sure they follow the logic of his arguments. If he used highly technical terms, they would be lost. He knows that some of these kids will grow up to be great engineers, but right now he/she “becomes a teenager” so that they can understand. In fact, if he/she is in the USA with American kids, he/she speaks to their culture (so he/she “becomes an AMERICAN teenager”). But let’s say that the engineer is Pakistani American. His/her parents immigrated to the USA before he/she was born. He/she was born in the US, so grew up surrounded by and fluently knows American culture. But his/her folks, relatives & friends who are also of Pakistani roots keep their culture alive all through the engineer’s life. He/she speaks fluent Urdu & Punjabi, knows slang, inside jokes, music, movies, TV shows & Pakistani media, sports & movie/music stars, etc., etc. So this Engineer once a year travels to Pakistan to teach kids there just as they do with American kids. AGAIN, he/she adapts for his/her audience. Though he/she MIGHT speak English, it’s mixed with the local language. When they break down concepts and explanations, they are geared for Pakistani, not American kids. He/she can do this easily because of his/her unique heritage & life experience. In this case, the engineer “becomes a PAKISTANI TEENAGER” so his/her audience understands. Does this make the engineer a liar? We all know that a good teacher/communicator tailors his message for his/her audience. If they fail to do this, the message is lost. That’s like Paul. When he spoke to Jews, he used Jewish vernacular. He knew it because HE WAS JEWISH. When he spoke to Greeks/Romans, he used that vernacular because, as a Roman citizen who he grew up in the culture, HE KNEW IT! Paul found ways to relate to people so they could understand his message, not so he could lie to them, trick them or be dishonest. When he wrote those words, he was also telling Christians that they needed to be flexible with those who were not like them and find ways to open up to people who might not share their experience. He was saying that they needed to be learners, to be empathetic & to try to see through the eyes of others before they just started blabbing away. He wanted those who followed Jesus to act more like Him & make the effort to cross the communications divide. Paul talks a lot about humility and not forcing other people to be servants, but to serve them. This may mean you learn a new language or culture. It may mean you do something simple like adjusting your vocabulary so another person can understand you and feel comfortable around you. It means being kind, considerate, & humble, not lying. I hope this long explanation provides you with a fuller understanding of that passage. I hope you might consider taking this page off your list so it doesn’t create a hindrance to your message. Thank you, again, for your efforts and I wish you all the best.